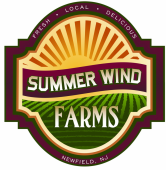 Summer Wind Farms, LLC is a fourth generation family farm located in Franklin Township in southeastern Gloucester County, New Jersey, about half way between Philadelphia and Atlantic City. The farm is owned by Frank A. Ferrucci, the fourth generation of the Ferrucci family to farm in this area. This season marks 100 years since Frank's great grandfather Michael settled in the Piney Hollow section of Franklin Township, and carved a farm out the South Jersey pine forest. The farm operates on over 100 acres, most of it USDA certified organic. Summer Wind Farms is USDA certified organic by Quality Certification Services of Gainesville Florida. To learn more about our production practices clisk the How We Grow tab. The farm offers a community supported agriculture (CSA) program. Please visit our vegetable and fruit CSA pages for more information and How to Choose a CSA Farm for tips about choosing a CSA that's right for you. We also sell wholesale to restaurants, produce retailers, farm markets, other CSA's, supermarkets and produce distributors, click the tab for Wholesale for more information. We grow a wide variety of crops including hybrid round and heirloom tomatoes, grape tomatoes, cucumbers, green beans, corn, onions, potatoes, squash, kale, lettuce, eggplants, radishes, peppers, broccoli, herbs, and many more. Our round and heirloom tomatoes are grown in certified organic, protected, high tunnel culture, ensuring a top quality product with a long shelf life. Click, Our Jersey Tomatoes for more information. We also produce certified organic vegetable and herb plants and patio planters. These along with our vegetables are sold through several of the area's top retailers as well as our retail farm market in Medford, and a weekly farmer's market in Haddon Heights, New Jersey. Click the Retail Markets tab for more information. Our Medford Farm Market, located at The Dutch Wagon Amish Farmer's Market, 109 Rt. 70 in Medford, NJ has become a hub of local, organic and specialty foods. Our market now offers Jersey Seafood along with other North American wild caught restaurant quality seafood. Visit the Jersey Seafood tab to learn more. To keep up with whats happening at our farm sign up for our newsletter.